Aunt Ruby's Honey Roasted Peanuts are a delightful blend of peanuts, sugar, honey, and salt. This combination makes for an irresistible treat that you are sure to enjoy! 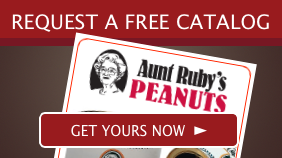 Aunt Ruby's Peanuts, North Carolina's finest Peanut, come in a variety of flavors including honey roasted. What could be better than the sweetness of honey and the crunchiness of roasted peanuts? Not much in our book. As such we offer these sweet and salty snacks in individual 20-ounce or 40-ounce tins or in gift packs of four-20 ounce tins or four-40 ounce tins. For those of you with a long list of friends, you can also order 12-12 ounce tins, 20-12 ounce tins, or a variety of 12-ounce and 20-ounce tins. Our Honey Roasted Peanuts make wonderful gifts or as treats when guests stop by. These are excellent for snacks in lunches and for people on the go. They also make outstanding ingredients for all kinds of dishes such as pie crusts, cake frosting, and homemade chocolates. Just lightly crush and mix right into pie dough and you have a little bit of North Carolina heaven with your cobblers and pies. 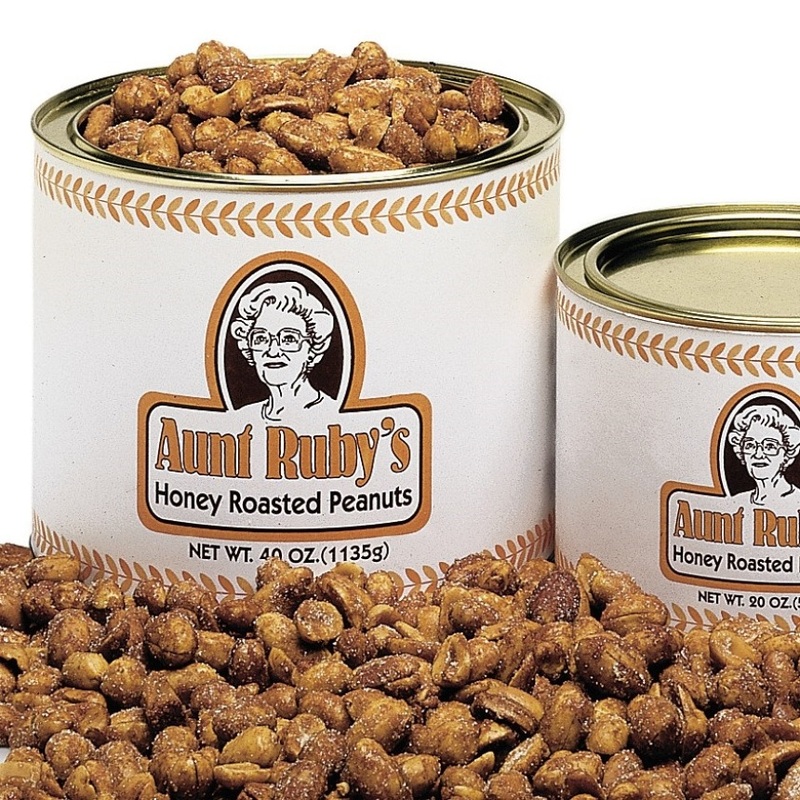 The beautiful thing about Aunt Ruby's Honey Roasted Peanuts is that they are available all year long. Start your Christmas shopping early or send these as a thank you gift. You can always keep a few tins tucked away for unexpected guests and be sure to have at least one tin in your pantry for baking. Made a pit stop at Aunt Ruby's on my way to Savannah last weekend and purchased a tin of honey roasted peanuts. They are so delicious and sooo addicting. Definitely going back for more. I give you a 10 rating! Your peanuts are the BEST IN THE WORLD! Anyone I have shared my Aunt Ruby's Peanuts with, all agree! But you know it spoils them for life. No other peanuts can compare with the flavor, freshness, size and crispiness. I used to stop in at your Enfield location for my favorite peanuts when traveling south to visit my Mother in GA, but now she lives in Va. too. I ordered a dozen 40 oz cans to share with my special friends and family.I was tempted to order the super delicious honey roasted and the chocolate peanuts but the gourmet roasted peanuts are a very healthy and satisfying treat for Everyone! Received as gift after wife was at Christmas show in Charlotte, couldn't put can down and had to hide from wife, best ever !!!! the BEST peanuts you will EVER eat! Wow! Best peanuts I have ever had! Received a can of these for Christmas and couldn't stop eating them! Best honey roasted peanuts ever, love how they are actually coated with flavor!